The agreement has caused outcry from Brexiteers and Remainers alike. BRITAIN’S EXIT FROM the European Union appeared to take a decisive step forward last night as Prime Minister Theresa May secured cabinet approval for the draft withdrawal agreement. But what is in the agreement and what happens next? The 585-page draft withdrawal agreement is essentially the divorce deal between Britain and the EU. The ‘backstop‘ mechanism to prevent a hard border on the island of Ireland. The rights of British citizens on the continent and the rights of EU citizen in the UK in a post-Brexit world. The UK’s financial settlement for exiting the union. Plans for a post-Brexit transition period during which both sides hope to hammer out a new trade deal. The agreement contains several contentious clauses that Brexiteers will find hard to swallow but perhaps the most controversial element is the ‘backstop’ plan which keeps Britain in a customs union with the EU until a trade deal is agreed that avoids the need for border checks with Ireland. The draft agreement describes this as a “single customs territory”. It will kick in if there was no long-term trade agreement and no extension of the transition. It will take the form of a temporary customs union encompassing not just Northern Ireland but the whole of the UK. There would be extra non-customs checks on some types of goods passing between Northern Ireland and the rest of the UK. If either the UK or the EU decides it wants the ‘backstop’ to come to an end, they must notify the other and a joint ministerial committee will meet within six months to consider the details. Crucially, the ‘backstop’ can only be halted if “the Union and the United Kingdom decide jointly”. What else is in the text? The controversial area of fishing access is excluded from these potential customs arrangements. The UK must also observe “level playing field” commitments on tax, competition, employment, state aid, as well as employment and environment standards. In a procedural sense it’s all straightforward. The agreement must be ratified by both the European Parliament and the parliament in Westminster before Britain is due to leave the EU on 29 March next year. However, getting the agreement passed by parliament currently looks like a very tall order for May, who is in the House of Commons today trying to sell the deal. Reports currently indicate that the deal will be firmly rejected by the Commons, however the government can delay calling a vote until it believes it has the numbers to get it over the line. But to complicate things further, this morning brought a slew of cabinet resignations including Dominic Raab stepping down as Brexit Secretary. The DUP, on which the Conservative Party relies to support its slender majority, has said it will not back the agreement. Hardline Brexiteers in May’s party have cried betrayal over the agreement’s vision of a close future relationship between Britain and the EU. Jacob Rees-Mogg, leader of an influential group of anti-EU MPs, has urged colleagues to reject it and is said to be submitting a letter of no confidence in Theresa May. The scale of the rebellions means May will almost certainly have to court opposition MPs. Labour leader Jeremy Corbyn has indicated he will reject the deal but several individual Labour MPs have said that they fear it is preferable to no deal at all. Last night May said if MPs rejected the deal they faced Britain leaving the EU without agreement, which experts say could lead to potentially catastrophic economic and legal disruption. A small but growing number of Conservative MPs back a second vote with the option to stay in the EU, although May has rejected the idea. The news from Europe is much more positive as the EU is preparing a rapid summit to sign off on the agreement. European Council President Donald Tusk said in Brussels that unless problems emerge as EU member states examine the deal, he will host a summit to sign the accord in Brussels on November 25. Speaking in Brussels, Tusk said EU member states would have until Tuesday next week to examine the deal and to agree the wording of a parallel political statement setting out goals for the bloc’s future relations with London. After that, preparations will begin for an EU summit. Email “The draft Brexit deal is 585 pages long. What's in it and what happens now?”. 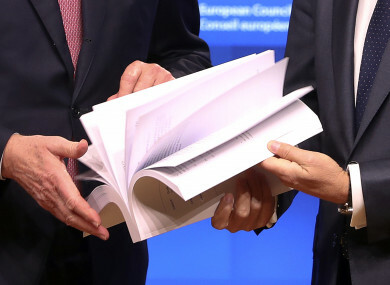 Feedback on “The draft Brexit deal is 585 pages long. What's in it and what happens now?”.